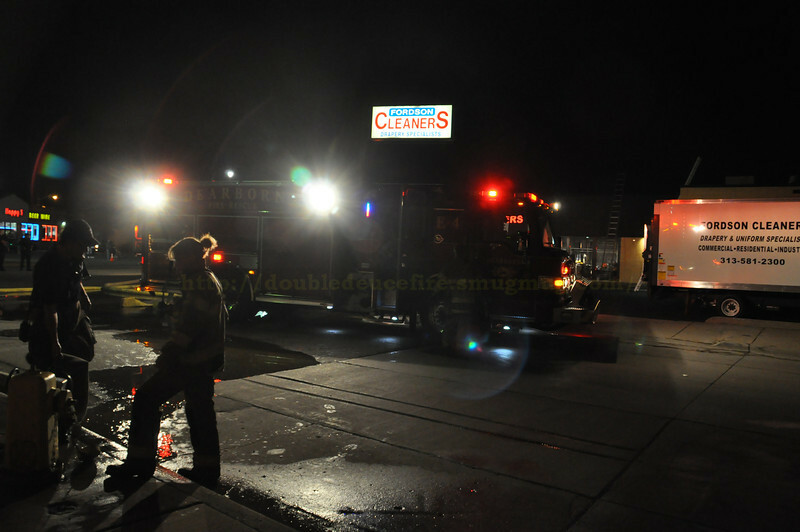 Just two weeks after Fordson Cleaners reopened following a serious fire in March, the east Dearborn business was ablaze again Tuesday night. The Dearborn Fire Department was called to the scene at 9:47 p.m., with reports of smoke billowing out of the front doors. The business was closed at the time; no one was inside. Battalion Chief Richard Cunningham said that trucks from stations 1, 3 and 4 responded to the fire, which was out by 10:15 p.m.
Dearborn police closed down Michigan Avenue just east of Schaefer Road for about an hour. The westbound side of the road was reopened just before 11 p.m.
Cunningham explained that the fire was contained within the building, and that clothing stored within the front of the store was not damaged. However, Cunningham added that the extent of the damage was not yet known. The cause of the fire also remained unknown Tuesday night. Fordson Cleaners, which has been in business since 1949, suffered more severe damage in the March fire. Renovations were extensive, and the business reopened in late August, according to WDIV. "As bad as the fire was, I've got a smile on my face," owner Mike Partrich told Channel 4. Partrich also reported a break-in at his business in July while it was still under construction. Items stolen included a water meter, copper piping and a back-flow preventer. Partrich was on the scene Tuesday night, but was unavailable for comment as he assisted the fire department in surveying the damage and cause of the fire to his business.